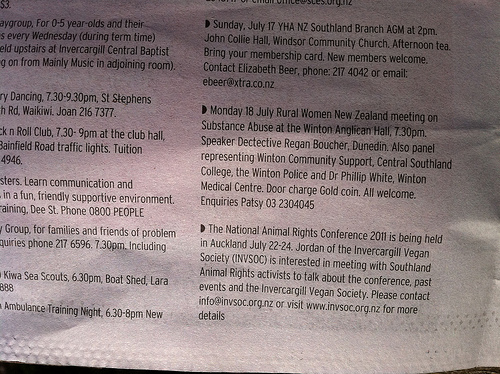 The Invercargill Vegan Society is mentioned in The Eye, a free Invercargill newspaper that covers upcoming events. I'd love to hear from other Animal Rights activists in Invercargill RE attending the National Animal Rights Conference 2011, held in Auckland. Fish Guts make everything better, two for the price of one! Who WOULDNT want this product?!?!?! Danger, Danger Will Robinson - terrible "Twitter Generation/Telegram era" spelling ahead! 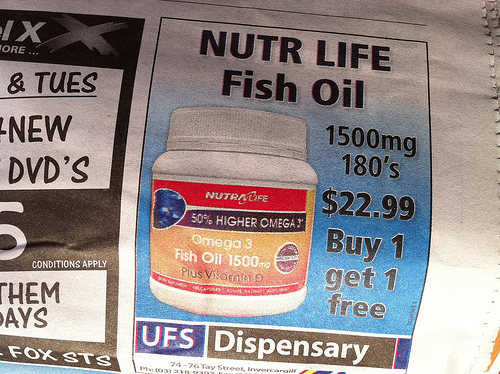 Gerald in Marketing : "Right, so who's our target demographic...I KNOW! White guys wearing black vests, facepaint, camo gloves and did I mention facepaint? OH, and they're usually pissed off, so make it about "madness", and make the sale banners look like police cordon tape, you know, like "have you just killed, skinned, preserved and eaten your partner? To celebrate, buy your tenth gun from us!" 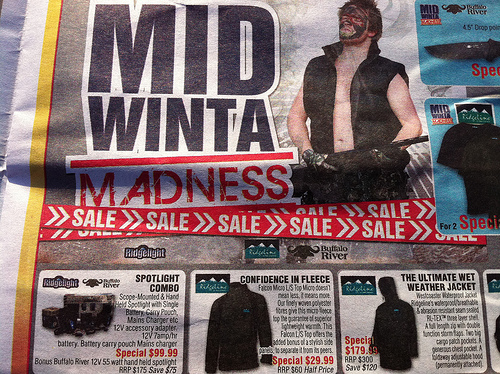 Also advertised, a long jacket that mentions "will keep your ears warm", because THATS the largest problem with Manly Men killing other animals for kicks in the early morn, cold ears, right? Gee, us silly Vegans sure are missing out! 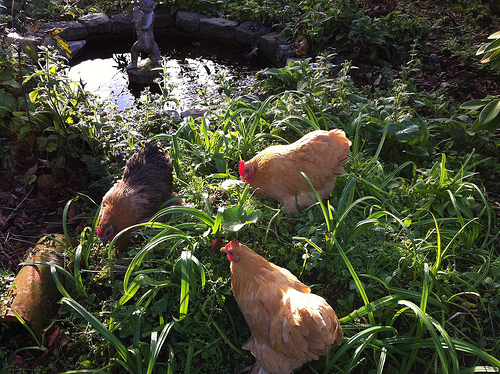 Or search for " Coexisting With Nonhuman Animals "
World Vegan Day 2012 Clips Wanted!!! Latenight Geocaching helps promote Veganism! Other Great Abolitionist Vegan Shows! "I'm Vegan and I love you!" badges on my work overalls! "A knife through my brain isn't humane"
Episode 89 2012....The End...of Non Veganism? Episode 87 Eco Festival 2012, Vegan Cooking Classes and Vegan Pizza! Episode 72 Vegan Food...FROM HELL! Episode 69 Non Veganism is like Cement "it hardens you up"
Episode 64 The INVSOC Ten and Corporate Propaganda in our primary schools, "courtesy of our friends at the meat council"
Episode 62 Watch the "IT"
Episode 52 The New Zealand Diet: where you come to lose weight and be as thin as possible! Episode 51 Giant "Dairy" Monopoly: "No need for regulation, you can trust us!" Episode 47 "Free Range is just Another Word for, Nothing Left to Lose"
Episode 44 "Wow I'm on the Radio!" Episode 37 Hey Hey Hey, Nah Nah Nah! Episode 32 "Center For Consumer Freedom"
Episode 24 "A Knife Through My Brain Isn't Humane"
Episode 17 Get Some Kiwi In Ya!